Will Syria's Strife Rip Lebanon Apart? The assassination of Lebanese security chief brigadier general Wissam Hassan on October 19 has rekindled fears of renewed confessional strife in Lebanon. The anti-Assad opposition quickly blamed the Syrian regime for eliminating one of its foremost Beirut opponents while enraged demonstrators took to the streets to demand the resignation of prime minister Najib Miqati. Yet while the persistence and intensification of the Syrian civil war has undoubtedly amplified Lebanese instability and placed the country's fate on the edge, the assassination is unlikely to "drag Lebanon into the fray." Western countries, Saudi Arabia, and Iran are not interested in destabilizing Lebanon, and Syria has lost its ability to manipulate its neighbor's internal affairs. The tables have turned, and it is Syria's time to suffer. Despite their deep ideological divisions, the Lebanese appear to have come of age and learned to prevent their differences from reaching the point of open confrontation. While the Lebanese government stays officially neutral in the current Syrian civil war, its various confessional groups surreptitiously seek to support one side or another in the fighting. 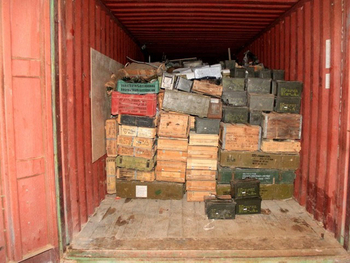 The Sierra Leone-registered Lutfallah II was detained by the Lebanese navy for illegally transporting arms and ammunition, seen here, to Syrian rebels. The Syrian conflict has thus far caused greater economic difficulties than political ones for Lebanon, especially in the investment, banking, tourist, and agricultural sectors. Fearing a Syrian spillover, some Persian Gulf entrepreneurs are refraining from investing in the Lebanese market, which depends on these investments to plug its current account deficit estimated at $5.6 billion (or 14.4 percent of the country's gross domestic product). According to economist Muhammad Shamseddine, Lebanon has become "Syria's backyard in circumventing Western trade and banking sanctions against it." Riad Salame, governor of the Central Bank of Lebanon, acknowledged the adverse impact of the situation in Syria on Lebanese banks, which are by far the country's most important economic sector. He reports that seven Lebanese banks with branches in Syria "have taken provisions based on stress tests of about $380 million in anticipation of loans that could not be repaid." Realistically, Beirut cannot completely implement European and U.S. sanctions on Syria since Damascus can retaliate and choke off Lebanon's substantial exports to the Persian Gulf by closing its land borders. In addition, Syria has strong allies in Lebanon who can easily ignore cabinet decisions to comply with the sanctions. The crisis in Syria and the state of tension in Lebanon have had a negative effect on the latter's tourist sector. Visitors from the Persian Gulf states and Jordan have stopped coming to Lebanon via Syria. A further crippling blow to tourism occurred when angry rioters in the predominantly Shiite suburbs of Beirut threatened to kidnap gulf tourists in response to the abduction of a Lebanese Shiite in Damascus by the Free Syrian Army (FSA). The Gulf Cooperation Council reacted by ordering their subjects to refrain from travelling to Lebanon, causing the loss of seven billion dollars in expected revenues. The Assad regime also sought to link the fate of Lebanon to the vicissitudes of the Syrian crisis so as to prevent its transformation into an anti-Syrian hotbed. Damascus ruled out the possibility that Saad Hariri would return to the premiership, insisting instead on Miqati's appointment to that post in June 2011. The Syrian uprising was just beginning at that time, and the Assad regime still held important political assets in Lebanon. But as soon as it became clear that the Syrian uprising was not going to end soon, Miqati opted for officially dissociating Lebanon from the crisis, appealing for Arab countries' help in shoring up Beirut against the untoward developments next door. However, the official position of the Lebanese government does not usually mean much in view of its inherent weakness vis-à-vis the disproportionate strength of the major sects. Groups such as the Iranian-created and backed Hezbollah, former Sunni prime minister Saad Hariri's Saudi-patronized Future Trend, the anti-Syrian Christian nationalist Lebanese Forces, the Progressive Socialist Party (PSP) of maverick Druze leader Walid Jumblatt, and the pragmatic and secularizing Shiite Amal Movement have actually transformed Lebanon into a major regional political actor in relation to this crisis, an unprecedented development that has turned the relationship between the two countries upside down. The Syrian patron for nearly forty years has suddenly splintered into warring factions working with the former Lebanese clients on an equal footing. Much to the chagrin of the pro-Assad Lebanese army command, Lebanese Sunnis have provided a major base of support for the FSA. A Lebanese army bulletin cautioned against efforts to infiltrate its ranks and implicate it in regional issues. This stern warning by army commander Jean Qahwaji came after intelligence agents arrested a Sunni officer and several civilian accomplices affiliated with Hariri's Future Trend on grounds of stealing weapons from an army depot and giving them to the FSA. Rifaat Eid, secretary general of the historically Alawite-based Arab Democratic Party, accused the Future Trend of training and arming members of the FSA in Tripoli and blamed it for vandalizing Alawite property in the city. Eid's accusations were not isolated. The Syrian regime has, since the beginning of the uprising, regularly charged the Future Trend with arms smuggling. Syrian ambassador to Lebanon, Ali Abdulkarim, reiterated his country's frustration over the failure of the Miqati government to curtail the Future Trend's sponsorship and support of arms smuggling, which he said violated the prime minister's dissociation policy. The Russian foreign ministry spokesman, Alexander Lukashevich, corroborated these charges and called upon the U.N. Security Council to put an end to arms smuggling from Lebanon to Syria. He referred to the Syria-bound ship, Lutfallah II, intercepted by the Lebanese navy in April 2012 en route to Tripoli and laden with arms for the rebels. Meanwhile, Lebanese armed forces chief Qahwaji has not responded to Syrian incursions and frequent shelling of Lebanese border villages while military intelligence operatives have abducted many anti-Assad Syrian activists and handed them over to the authorities in Damascus. In response to its collusion with Syrian government forces, the Lebanese army has lost its legitimacy in the eyes of most Lebanese Sunnis who have ceased to consider it "an embodiment of the country's unity." Although Hariri has consistently denied any involvement in arms smuggling to Syria, he never hid his desire to see the Assad regime fall. In fact, Future Trend spokespersons have repeatedly expressed their strong belief that Assad's exit from the political scene is unavoidable. Echoing a similar perspective by other leaders in the anti-Syrian March 14 coalition, Samir Jea'jea, leader of the Lebanese Forces Party has declared that it was "only a matter of time before the Syrian revolution triumphs." He has distanced himself from the pro-Assad position of Lebanese Maronite patriarch Bishara al-Ra'i and reminded coreligionists that "Assad had broken the back of Lebanese Christians." Likewise, in an interview with a Saudi newspaper, Butrus Harb, a parliamentary deputy affiliated with the March 14 coalition, accused the Syrian regime of attempting to assassinate him in collusion with its local allies. He said the regime in Damascus "has launched a campaign of sabotaging Lebanon's peace." The Syrian uprising—which has inspired Lebanese Sunnis and partially militarized them—has placed Hezbollah in an awkward position. The succession of events in the region does not augur well for its future as Tehran's forward military division. Hezbollah has been actively involved in the fighting on the Assad regime's side since the beginning of the uprising but in a relatively subdued fashion. In May 2012, a confrontation between Hezbollah and the FSA occurred over the abduction of Lebanese Shiite "pilgrims" near Aleppo, allegedly working on behalf of the Syrian regime. Then in August, a member of the Lebanese Shiite al-Miqdad clan was kidnapped and identified by the FSA as a Hezbollah sniper fighting on the side of Syrian government troops. The clan responded by announcing the formation of a military wing and launching a counter abduction campaign against Syrian laborers in Lebanon. While releasing two of the "pilgrims," the FSA demanded an apology from Hezbollah head Hassan Nasrallah as a precondition for releasing the rest. Instead, Nasrallah threatened to declare war on the FSA. In October 2012, Hezbollah publicly announced for the first time the death of a number of its men during a "jihadist mission" in Syria. Despite its close affinity with the Assad regime and its occasional bellicosity, Hezbollah includes elements that are keen on preventing the war in Syria from spilling over into Lebanon. Damascus seems determined to spread chaos into Lebanon as a means of convincing the international community that other countries in the region are not impervious to the crisis. Former Hezbollah chief Subhi al-Tufaili pointed out that the Syrian regime made no secret of its expectation "that the entire region would go on fire unless the country's uprising is halted." He criticized Nasrallah for taking the wrong side in the Syrian crisis: "The position of Hezbollah is subjecting Lebanese Shiites to retribution after the fall of the Syrian regime." Paul Salem of the Carnegie Middle East Center expressed concern that the demise of the Assad regime might render Hezbollah impotent and invite a crippling Israeli military operation against Lebanon. According to the Kuwaiti paper Al-Anba, Hezbollah is going through an existential crisis because "its strength does not emanate from the vast array of weapons it possesses, but from the regional function it performs on behalf of Iran and the Syrian regime." The paper notes that Hezbollah is aware of its predicament, which simultaneously encourages Speaker of the House and rival Amal Movement leader Nabih Berri to "attempt to seize the limelight from his Shiite rival group." Hezbollah is not oblivious to the quandary in which it finds itself. Shortly after the Shiite kidnappings, angry demonstrations broke out in the southern Shiite suburbs of Beirut in protest over these events, disrupting normal operations of the nearby Beirut international airport. Surprisingly, Hezbollah invited the Lebanese army to restore law and order in the area. Clearly embarrassed, Muhammad Fneish, a member in Hezbollah's parliamentary bloc, told the Future Trend's flagship media outlet that the party "is not responsible for the demonstrators' disturbance of the public peace, and invites the state to shoulder its responsibilities." While Hezbollah aims to give a helping hand to Assad's forces without reigniting Lebanon's civil war, its rivals find themselves playing similar games. In August 2012, a Lebanese military tribunal indicted Ali Mamluk, head of the Syrian National Security Bureau, and Michel Samaha, former Lebanese parliament member and cabinet minister, on grounds of conspiracy to set off explosive devices in Lebanon and trigger civil war. Despite the damning evidence that implicated the Syrian government, Prime Minister Miqati's criticism was mild and did not refer to the Assad regime by name. President Michel Suleiman then instructed the minister of foreign affairs, Hussein Mansour, to hand the Syrian ambassador a memorandum of protest. Mansour, a member of the pro-Syrian Shiite Amal Movement, refused and instead sent the ambassador an apparently innocuous memorandum. When asked by a reporter to justify his mild response, he said: "There are no hard feelings between our two sister countries." Nabih Berri, Amal's leader, has remained mostly quiet on the developments in Syria, neither praising the Syrian regime nor criticizing the opposition, delegating these tasks to second tier members of the movement. Berri seems to be betting on Assad's eventual departure from the scene and is thus seeking to secure for himself a leading role in Lebanese politics in the post-Assad period. This calculation appears to view Assad's exit as an opportunity to weaken the position of his Shiite rival, Hezbollah. Similarly, Walid Jumblatt, who leads the predominantly Druze Progressive Socialist Party, did not deny that the Syrian crisis had created discord in Lebanon although he refused to call it "a Sunni vs. Shiite division." He recognized the threat of the Syrian situation to Lebanese stability but expressed confidence that the rival factions were "managing their differences and keeping them civil." Following the extradition of fourteen anti-regime, Syrian activists to Damascus, Jumblatt led a successful drive to discontinue this practice. His tough stand on the matter generated a heated debate in Lebanon and drove Western ambassadors to demand granting asylum and accommodation to Syrian activists and refugees. The U.S. ambassador in Lebanon, Maura Conelly, expressed her country's deep concern over the deportation of Syrian refugees "and demanded providing them with refuge, in keeping with Lebanon's humanitarian responsibilities." Jumblatt continued to denounce Assad and implore the Druze in Syria to join the uprising but eschewed revolutionary change in Syrian politics in favor of Assad stepping down in a Yemeni-type exit akin to that of Ali Abdullah Saleh. He apparently prefers the introduction of an accommodationist political system in Syria, in which the political rights of its minority groups, including the Druze, would be safeguarded. While the Assad regime continues to wield significant, if decreasing, political, security, and economic influence on its small and polarized neighbor, it is not likely that it can shape the course of events there. If anything, Syria's domestic troubles offer the Lebanese people a rare opportunity to work out their differences without outside manipulation and usher in a new era in national politics in which foreign powers do not continually play one ethnic group against another. Washington appears committed to preventing the collapse of security in Lebanon as a result of the raging conflict in Syria. Ambassador Conelly reiterated the "U.S. commitment to a stable, sovereign, and independent Lebanon." It is in this context that one can understand the sudden display of resolution and might by the Lebanese army in responding to security breaches in the southern suburbs and in Tripoli. The existing modus operandi is to respond to the Syrian crisis by officially observing neutrality without obstructing the country's two major political coalitions from supporting the faction of their choice across the border. In response to the Hassan assassination and attendant calls for Miqati's resignation, the French ambassador rushed to President Suleiman to emphasize the importance of allowing the government to "continue performing its duties." His British counterpart, who also talked to the president right after the assassination, echoed the same position: "The best response is … through solidarity, unity, and resilience." With the army swiftly containing the sporadic skirmishes in Beirut and Tripoli and President Suleiman urging Miqati to "stay on in the national interest," the predictions of a renewed Lebanese civil war seem largely premature. See, for example, Max Fisher, "Why Wissam al-Hassan Matters for the Middle East," The Washington Post, Oct. 19, 2012; Mike Giglio, "Does the assassination of Wissam al-Hassan reopen a bloody chapter of Lebanon's past?" The Daily Beast, Oct. 20, 2012. Tess deBlanc-Knowles, "Syrian Conflict: Lebanon at Risk," Institute for National Security Studies, National Defense University, Washington, D.C., Mar. 20, 2012. Al-Arabiya News Channel (Dubai), July 25, 2012. "Riyah ar-Rabi al-Arabi: Lubnan wal Iraq yushakilan as-Suq al-Wahid lil iqtisad as-Suri," Iktissadiat, Aug. 26, 2012. The Daily Star (Beirut), July 12, 2012. An-Nahar (Beirut), June 20, 2012. Al-Jazeera TV (Doha), Dec. 10, 2010. "Orientation Bulletin," no. 1/2012, Lebanese Army, Mar. 9, 2012. Al-Akhbar (Beirut), Apr. 10, 2012. El-Nashra (Beirut), June 13, 2012. Tishrin (Damascus), Aug. 24, 2012. Al-Balad (Beirut), May 12, 2012. Now Lebanon (Beirut), Aug. 2, 2012. Ibrahim al-Amin, al-Akhbar, May 21, 2012. MTV (Beirut), Mar. 12, 2012. Okaz (Riyadh), July 18, 2012. Naharnet news website (Beirut), Aug. 26, 2012. Saidaonline (Sidon, Leb. ), Aug. 22, 2012. Al-Watan (Doha), Sept. 30, 2012. "Taqyim Ttada'iyat al-Azma as-Suriyya 'ala Lubnan fi markaz Carnegie lil sharq al-awsat fi Beirut," Carnegie Middle East Center, Beirut, June 25, 2012. Al-Anba (Kuwait), Aug. 24, 2012. Al-Jazeera TV, May 23, 2012. Al-Mustaqbal (Beirut), Aug. 17, 2012. Levant News (Beirut), Aug. 13, 2012. An-Nahar (Beirut), July 26, 2012. Al-Rai (Kuwait City), June 3, 2012. Embassy of the United States, Beirut, news release, Oct. 4, 2012. Ad-Diyar (Beirut), June 18, 2012. Lebanese Broadcasting Corporation, Oct. 20, 2012. Embassy of the United Kingdom, Beirut, news release, Oct. 20, 2012. BBC News, Oct. 21, 2012. Related Topics: Lebanon, Syria | Hilal Khashan | Winter 2013 MEQ receive the latest by email: subscribe to the free mef mailing list This text may be reposted or forwarded so long as it is presented as an integral whole with complete and accurate information provided about its author, date, place of publication, and original URL.